Great Britain: 1858-79 1d. red Plate 77, unused. bl.uk > Online Gallery Home	> Online exhibitions	> Philatelic rarities	> Great Britain: 1858-79 1d. red Plate 77, unused. Printer: Perkins, Bacon & Co. In 1858 it was decided to number the printing plates used for British 1d postage stamps. 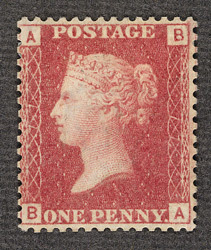 The first to be so numbered was plate 69 and the last of this series was plate 225, which was issued in 1879. Some plates were found to be defective and not used and this was the case with plate 77. This unused copy is one of only nine recorded. The plate number is to be found printed twice on each stamp in the side panels and is best seen in the enlarged photograph.